A substantial amount of research has been carried out in the last 30 years on assessing and improving the quality of health care. One of the observed shifts is the change from research questions such as "how quality can be measured" to "how quality can be improved". Despite considerable progress to answer both questions and the widespread application of quality strategies, quality and safety problems persist and the debate on how to accelerate and sustain quality improvement is more relevant than ever. In response to this debate a new research line related to the effectiveness of quality improvement emerged from the quality field in the last 10 to 15 years. This led to the research questions such as "does quality improvement lead to better quality of care? ", "which quality tools are most effective", "how can various quality tools be integrated into a sensitive quality and safety improvement programme" or "what factors impact on the implementation of quality strategies at hospital level"? These questions are of high relevance from the perspective of individual health care professionals and hospitals, which on one hand have to comply with existing legislation and statutory regulation on quality improvement, but on the other hand have significant latitude to select from a range of quality tools to target organization-specific quality and safety problems. From the perspective of health care purchasing agencies and policy makers the research questions related to the effectiveness of quality improvement are highly relevant and form part of the global accountability and transparency agenda. 1. to further develop a comprehensive “maturity classification model” for the assessment of organizational quality improvement systems in EU hospitals (based on the existing MARQuIS maturity classification). 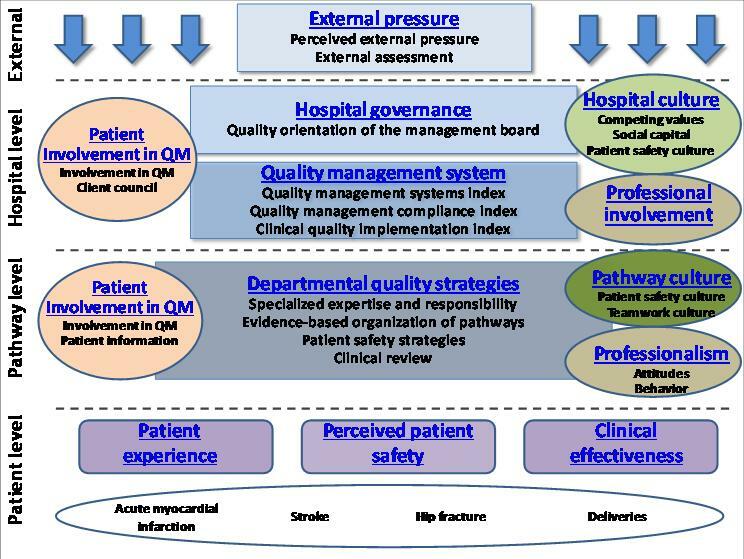 2. to investigate associations between the maturity of quality improvement systems and measures of organizational culture, professional involvement and patient empowerment (at hospital level). 3. to investigate associations between the maturity of quality improvement systems and measures of clinical effectiveness, patient safety and patient involvement (at patient and departmental level). 4. to identify factors influencing the uptake of quality improvement activities by hospitals including external pressure as enforced by accreditation, certification or external assessment programmes. Data for the assessment of hospital-wide constructs was planned to be collected in 30 randomly selected hospitals in each of the 8 participating countries. In each country, for 12 of these 30 hospitals we carried out additional data collection at the patient-level, for four conditions (stroke, acute myocardial infarction, hip fracture and delivery). DUQuE project partners assessed the following measures at hospital/department level: external pressure, hospital governance, quality improvement system, patient empowerment in quality improvement, organizational culture and professional involvement. These measures will be assessed using questionnaires. The following measures were assessed at patient level: clinical effectiveness, patient safety and patient involvement. Measures of clinical effectiveness and patient safety were retrieved through audit of medical records and direct observation; for the assessment of patient involvement we used questionnaires. In addition, from each hospital we will collect additional generic measures of patient safety and clinical effectiveness using administrative data. A dedicated IT platform was developed to facilitate hospitals’ and professionals’ response to the questionnaire, integrating the results from the records audit, hospital administrative data, and results from patient involvement surveys. Statistical analysis was based on appropriate descriptive, psychometric analyses and multivariate analysis.